Wintry weather has already made an appearance in Boston; we had our first snow, albeit a small one, last weekend. I hate being cold outside and abhor feeling cold indoors even more, but I also, like a true New Englander, am always reluctant to turn on the heat. My best solution for cold days at home is to have something in the oven pretty much at all times. And since I can’t always be making and eating desserts, my favorite thing to do is braise meat or chicken. The cooking time is nice and long, so it will really warm up your house (or at least your kitchen). The bonus effect of this heating strategy is that you will also be really well fed. 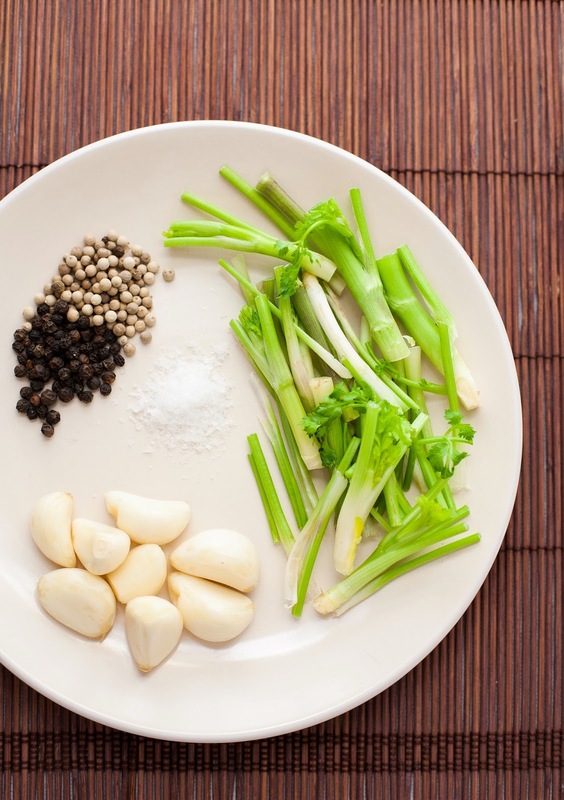 Kratiem prik thai is a seasoning paste made of garlic, pepper, and cilantro roots, and it’s usually used in Thai stir fries. However, a stir fry won’t warm up the kitchen for long, and I found myself craving this delicious flavor triad on short ribs, which are perhaps my favorite cut of beef. After a quick sear, the meat is rubbed with kratiem prik thai and cooked in a low oven for an hour and a half with some coconut aminos (or tamari) and a bit of rice vinegar. The seasonings melt into a glaze, and the meat becomes irresistibly tender. If you can’t find full cilantro plants at the store, you can use the bottom portion of the stems in place of the roots. And, if you don’t have white pepper, you can use all black. Don’t let anything get between you and these ribs (and the warm kitchen that comes with them). If you’re looking to braise some other kinds of meat, check out my braised chicken with leeks and scallions, Nom Nom Paleo‘s oven-braised Mexican beef, these coffee-braised lamb shanks that David Lebovitz made from Joshua Weissman’s cookbook , or these crispy duck legs with braised vegetables from All Day I Dream About Food. Heat the ghee or oil in a large ovenproof skillet over high heat. Add the ribs and sear until well browned on all sides, and then transfer them to a plate. Drain all but one tablespoon of fat from the pan, reduce the heat to medium, and add the onion. Cook for 6-8 minutes, stirring occasionally, until beginning to brown. While the onion cooks, make the kratiem prik thai. 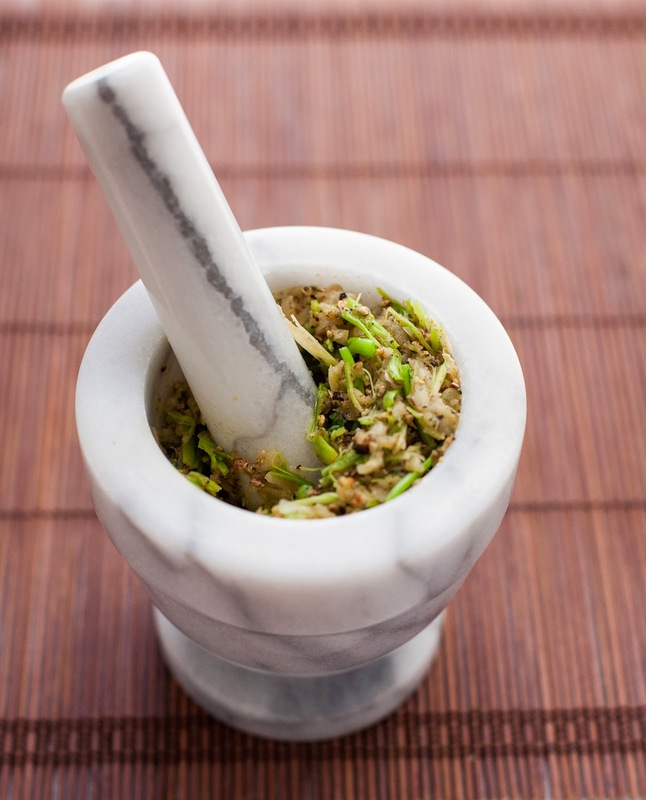 Use a mortar and pestle or spice grinder to grind the cilantro roots or stems, black and white peppercorns, and garlic into a coarse paste. 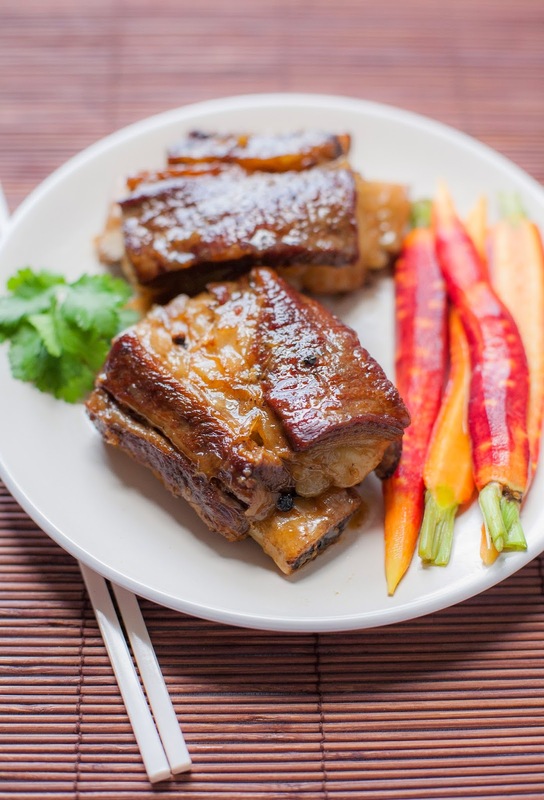 Rub the kratiem prik thai onto the short ribs and return the ribs to the skillet, bone side up. Combine the coconut aminos or tamari, fish sauce, and rice vinegar in a two-cup measuring cup, and add enough water to make two cups of liquid. Pour the liquid over the ribs, cover the skillet, and bake for 90 minutes. Flip the ribs over, return the pan to the skillet, and bake for 90 minutes more, until the meat is very tender. Serve hot. To make the quick-pickled carrots, place the peeled carrots in a shallow dish. Whisk together the rice vinegar, honey, and salt and pour over the carrots. Let sit at room temperature for at least 30 minutes or up to two hours. Drain before serving. These ribs are perfect for a cold winter day. However, I think they will be just as delicious on a gorgeous sunny South Florida day! Thank you, Betsy! I agree :). This always surprises people, but I have never been to Florida! I've wanted to go ever since I was a kid, but haven't made it down there yet. So jealous of your weather (and impressed that you bake so much despite the heat!). Wow, this looks soooo delicious. I definitely need to try this recipe. 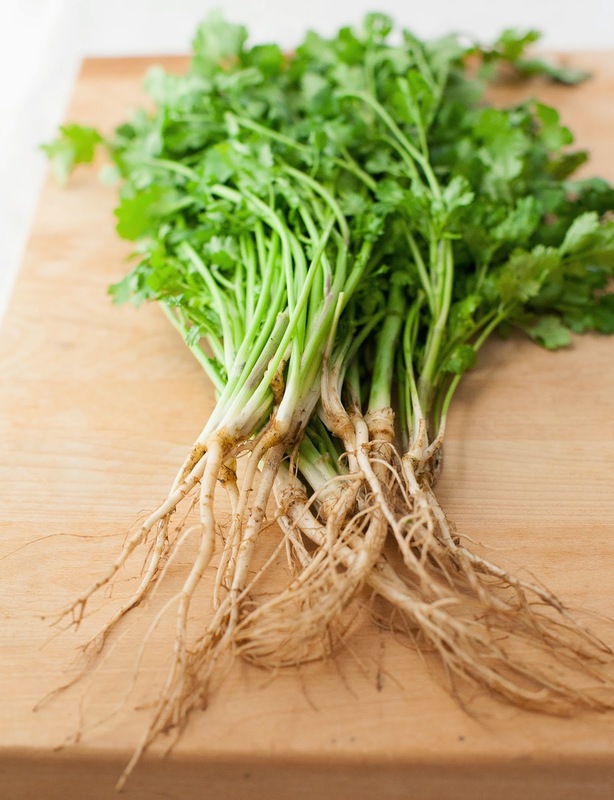 Cilantro roots are new to me – I use the leaves all of the time, but hadn't considered using more. 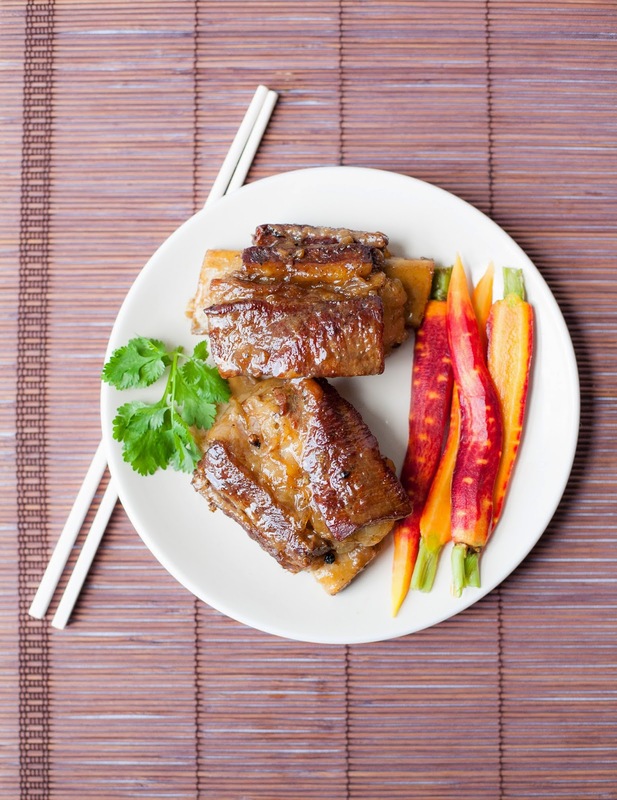 These short ribs look wonderful! Thanks, Marissa! So far I've only used cilantro roots in kratiem prik thai, but I'm eager to try them in other things. I think they can also go in curry paste!